Day 3 - Over the divide. Another beautiful morning. Today I would cross over from the Row River valley, which is in the Willamette drainage, to the North Umpqua. The road was still as wide as a highway with a good shoulder and zero traffic. The first few miles were easy and I started fantasizing that it would be that way the whole way over the divide. Of course not! At about 8 mile up I came to a fork. 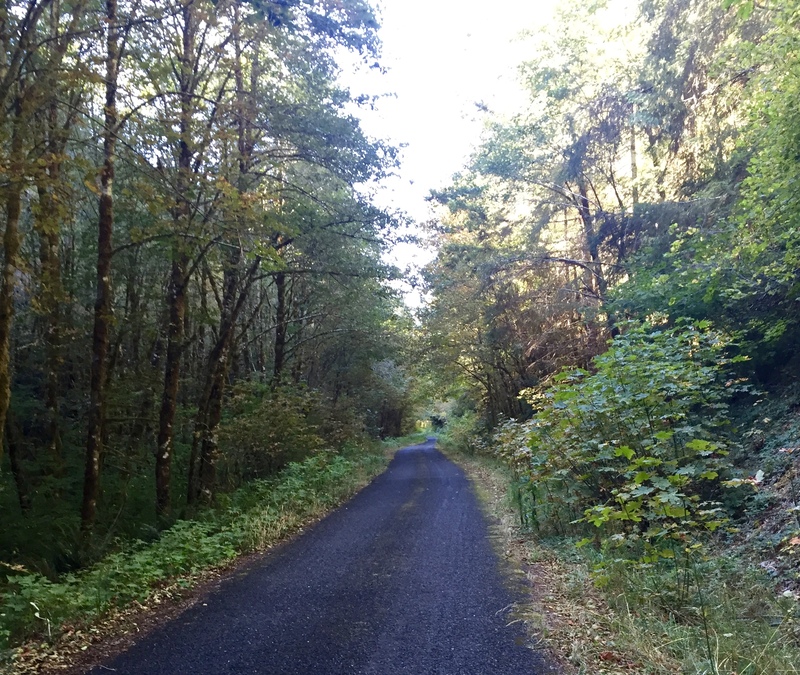 The map showed the gravel road on the left, as well as the paved road on the right, both going through to Canton Creek road, which is the road down to the North Umpqua. There was a road sign saying to take the paved Clark Creek road, and so I did. It was a nice single lane paved road all the way over. Very steep though. I had to push at least 2 miles of the 4 miles of 10% and steeper grade. Eventually I started noticing how high up I was and how stunning the views were. I was way up in the western Cascades. At the top there was a Y with no signs at all. The map showed the left fork as the road I wanted but it was very reassuring to see that someone had written "Steamboat" with an arrow on that road. Steamboat is the town on the North Umpqua I was headed for. "Every mountain has a down hill, every mountain has a fast thrill, you may be crawling on the upside, but you'll be flying on the down side." Sung to the tune of "Good Old Rock and Roll" by Bob Seeger. Just a little ditty I made up to get me over the top. Sure enough I was soon flying down the mountain. In this case the downhill was much longer than the uphill had been. I had not seen one car, but just 3 motorcycles the whole way over. I ran into the first car 12 miles from the top. It was a guy pulling a teardrop camper. He said his wife was not far behind riding a bike. I said he'd better wait for her before it got steep as it was a really hard climb. I ran into her a few minutes later, riding a light weight road bike and looking really fit. I told her about the steep climb but had little doubt she would have no trouble with it. I got out to the North Umpqua highway hoping to find a little store, but there was none. I didn't know at the time that the town of Steamboat was a little ways down the road in the opposite direction. So it was on to the campground, which was deserted except for Derral. 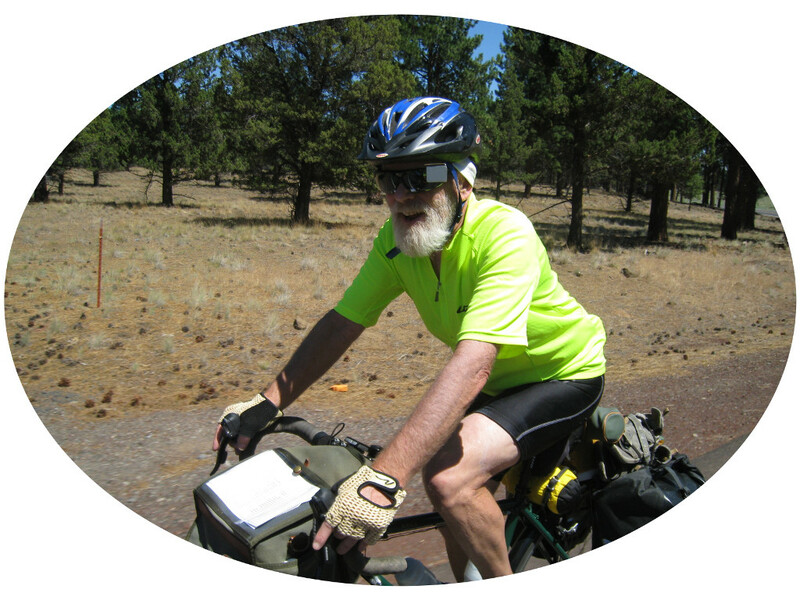 Derral had living in the Apple Creek campground BLM campground all summer. He had a big pile of firewood and all the comforts of living in the woods. He invited me for dinner. A while later when I showed up he offered me a beer and said to fish it out of the cooler. He had a bunch of typical American beer and two small cans he said someone had given him. I took one of those and saw it was Caldera. "Caldera" I said, "this is brewed in Ashland, where I lived for 25 years". "Ashland" he said, "you must be a liberal. I hate liberals". It was an interesting evening. He still fed me dinner and we managed to tiptoe around the political discussions. It somehow escaped him that he was living all summer, paying $5 a day, in a federal campground, the kind that republicans would love to shut down. I enjoyed the food, thanked him for it, and then went off to play my shakuhachi along the North Umpqua river on a beautiful moonlit night. Clark Creek road, a lovely single lane paved road over the divide. Beautiful view of the western Cascades from up high on the divide. Reassuring when someone marks your route on the road in chalk.